Welcome to The Gardens at The Kelly Gallery! Thank you for considering us for your special day. We would be delighted to host you and your family for your unforgettable wedding, reception, bridal shower, or other special event. The Kelly Gallery Gardens have been featured in Midwest Living Magazine and the Kansas City Homes and Gardens Magazine. The private gardens were designed and created by portrait photographer and artist Kelly Daniels. 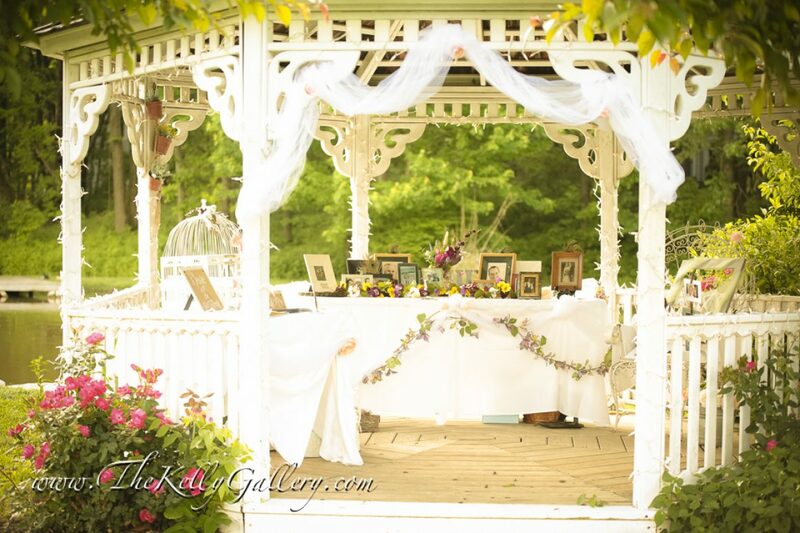 From the curved stone bridge at the edge of an intimate lake with a large willow tree to the English garden walkways, these gardens are perfect settings for weddings, celebrations, retreats, and backdrops for incredible artwork of children and families. You will feel a sense of peace when you step into the serenity of the private garden estate in Overland Park Kansas. The Kelly Gallery Inc is a photography business. The private gardens are a private property and only holds private parties held by the owners. Our fees are for photography only. People must go through a consultation and interview for a private invitation to an event on the property.